Kristin Tate argues that Donald Trump needs to be more actively devoted to following Jefferson’s example. After eight years of reckless expansion of the federal workforce under Barack Obama, Donald Trump vowed to downsize the wildly growing bureaucracy of Washington. In 2016, he promised to “cut so much your head will spin. However, during the first two years of his presidency, there has been no significant effort to reduce the bloated federal payrolls. In fact, the federal government is the largest employer in the nation. 2 Feedbacks on "Government Is Too Large and Employs Way Too Many People"
Not just too many government workers but they are also grossly overpaid. 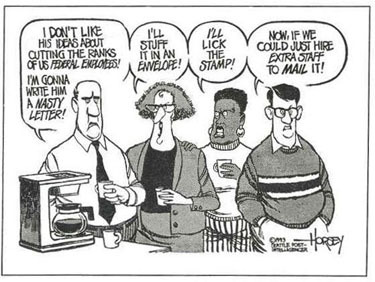 The bureaucratization of the society is far worse than just having a lot of government employees. Mises wrote of this in 1945. Following the passage below he spoke of the pre-WWI youth movement in Germany and how those that survived that war became faithful servants of Hitler and we know also subsequently Stalin. The description is far to similar to the “youth” movement of today. “HIGH-BROWS turn up their noses at Horatio Alger’s philosophy. Yet Alger succeeded better than anybody else in stressing the most characteristic point of capitalist society. Capitalism is a system under which everybody has the chance of acquiring wealth; it gives everybody unlimited opportunity. Not everybody, of course, is favored by good luck. Very few become millionaires. But everybody knows that strenuous effort and nothing less than strenuous effort pays. All roads are open to the smart youngster. He is optimistic in the awareness of his own strength. He has self-confidence and is full of hope. And as he grows older and realizes that many of his plans have been frustrated, he has no cause for despair. His children will start the race again and he does not see any reason why they should not succeed where he himself failed. Life is worth living because it is full of promise. “All this was literally true of America. In old Europe there still survived many checks inherited from the ancien régime. Even in the prime of liberalism, aristocracy and officialdom were struggling for the maintenance of their privileges. But in America there were no such remnants of the Dark Ages. It was in this sense a young country, and it was a free country. Here were neither industrial codes nor guilds. Thomas Alva Edison and Henry Ford did not have to overcome any obstacles erected by shortsighted governments and a narrow-minded public opinion. “Under such conditions the rising generation are driven by the spirit of the pioneer. They are born into a progressing society, and they realize that it is their task to contribute something to the improvement of human affairs. They will change the world, shape it according to their own ideas. They have no time to waste, tomorrow is theirs and they must prepare for the great things that are waiting for them. They do not talk about their being young and about the rights of youth; they act as young people must act. They do not boast about their own “dynamism”; they are dynamic and there is no need for them to emphasize this quality. They do not challenge the older generation with arrogant talk. They want to beat it by their deeds.